Is there any way to emulate a quantum computer in my normal computer, so that I will be able to test and try quantum programming languages (such as Q#)? I mean something that I can really test my hypothesis and gets the most accurate results. Update: I'm not really looking for simulating a quantum computer, but I'm not sure if its possible to efficiently emulate one on a normal non-quantum based PC. QDD is a C++ library which provides a relatively intuitive set of quantum computing constructs within the context of the C++ programming environment. QDD is unique in that the its emulation of quantum computing is based upon a Binary Decision Diagram (BDD) representation of the quantum state. QCE is a software tool that emulates various hardware designs of Quantum Computers. QCE simulates the physical processes that govern the operation of a hardware quantum processor, strictly according to the laws of quantum mechanics. QCE also provides an environment to debug and execute quantum algorithms under realistic experimental conditions. The downside to all of these is simple: they still run on binary (non-quantum) circuits. To the best of my knowledge, there's no easily accessible quantum computer to use for running these things. And since it takes multiple binary bits to express a single qubit, the amount of computational power needed to simulate a quantum program gets large very quickly. Our evaluation shows that our implementations are very accurate, but at the same time we use a significant amount of additional memory in order to achieve this. Reducing our aims for accuracy would allow us to decrease representation size, and therefore emulate more qubits with the same amount of memory. As our implementations get more accurate, they also get slower. TL;DR: it's possible, and some emulators exist, but none are very efficient for large amounts of qubits. Yes, it is possible to simulate a quantum computer on a normal one – But you most likely have to sacrifice efficiency. The dimension of the state space rises exponentially with the number of qubits ($2^n$, where $n$ is the number of qubits), so the linear algebra you will be dealing with won't be too light – You'll encounter very large matrices and the algorithm you use (regardless of how efficient it is) will likely become exponentially-scaling pretty fast. However, emulating a QC on a normal machine is definitely possible. The QX Simulator is a universal quantum computer simulator developped at QuTech by Nader Khammassi. The QX allows quantum algorithm designers to simulate the execution of their quantum circuits on a quantum computer. The simulator defines a low-level quantum assembly language namely Quantum Code which allows the users to describe their circuits in a simple textual source code file. The source code file is then used as the input of the simulator which executes its content. Quantum++ is a modern C++11 general purpose quantum computing library, composed solely of template header files. Quantum++ is written in standard C++11 and has very low external dependencies, using only the Eigen 3 linear algebra header-only template library and, if available, the OpenMP multi-processing library. Despite many common concepts with classical computer science, quantum computing is still widely considered as a special discipline within the broad field of theoretical physics. [...] QCL (Quantum Computation Language) tries to fill this gap: QCL is a high level, architecture independent programming language for quantum computers, with a syntax derived from classical procedural languages like C or Pascal. This allows for the complete implementation and simulation of quantum algorithms (including classical components) in one consistent formalism. Yes, it is possible to simulate quantum computations on a classical computer. But the cost of simulations grows exponentially with qubit count and/or circuit depth and/or particular operation counts. For trying ideas quickly, my simulator Quirk is great. It's an open-source drag-and-drop quantum circuit simulator that runs in your web browser. You can access a live version at algassert.com/quirk. If you're specifically looking at Q#, then it's super easy to use with an emulator -- in fact, it's not possible to have Q# but not have the emulator, they're bundled together. To get started, first you need to download .NET Core from Microsoft's website. When you download Microsoft's Quantum Development Kit through dotnet new -i "Microsoft.Quantum.ProjectTemplates::0.2-*" or Microsoft's website, it downloads both the language and Microsoft's own emulator together. Creating a new Q# project (dotnet new console -lang Q#) will automatically configure it to use the emulator, so when you type in some Q# and run the project it "just works". Yes. If you build it yourself, find a 3rd party computer with the same specs as the BullSequana M9600 series, or come up with €100K+ and buy a system from Atos. Notice the similarity between the BullSequana M9600 series and the Atos QLM. Same box (and probably internal components) with different software (but you wanted to use your own, Q#). Atos claims: "The highest-performing quantum simulator in the world". I'm not sure about that but the specs for the 30 qubit version are reachable, just two Intel CPUs and 1TB of memory. Is there any way to emulate a quantum computer in my normal computer, so that I will be able to test and try quantum programming languages (such as Q#)? If you use only 256GB of memory and 1-24TB of Swap Drive it will be slow but it will work. I mean something that I can really test my hypothesis on and get the most accurate results. "The Atos Quantum Learning Machine computes the exact execution of a quantum program, with double digit precision. It simulates the laws of physics, which are at the very heart of quantum computing. This is very different to existing quantum processors, which suffer from quantum noise, quantum decoherence, and manufacturing biases, as well as performance bottlenecks. 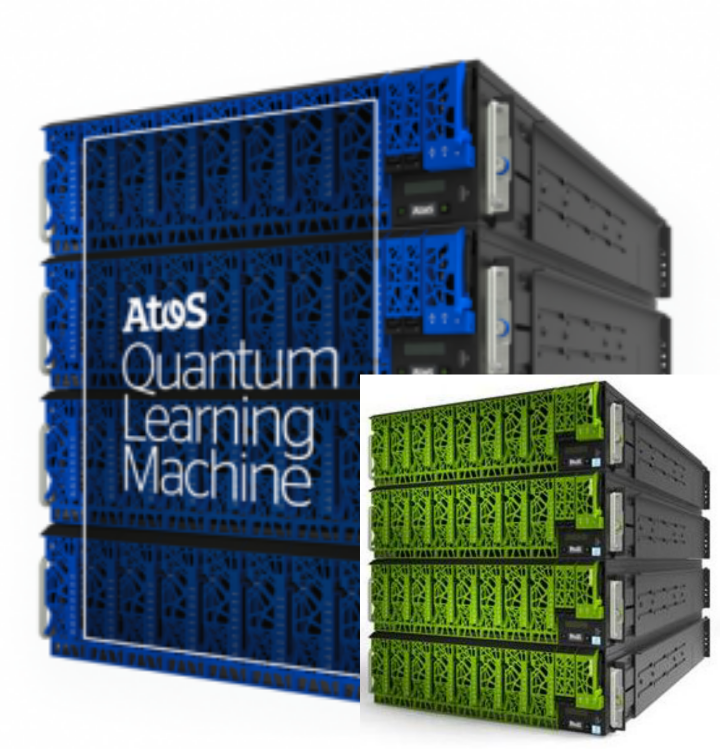 Simulation on the Atos Quantum Learning Machine enables developers to focus on their applications and algorithms, without having to wait for quantum machines to be available". qchas (qchas: A library for implementing Quantum Algorithms) - A library useful for implementing Quantum Algorithms. It contains definitions of Quantum Gates, Qubits. qubiter : The Qubiter project aims to provide eventually a full suite of tools, written mostly in Python, for designing and simulating quantum circuits on classical computers. Not the answer you're looking for? Browse other questions tagged emulation or ask your own question.